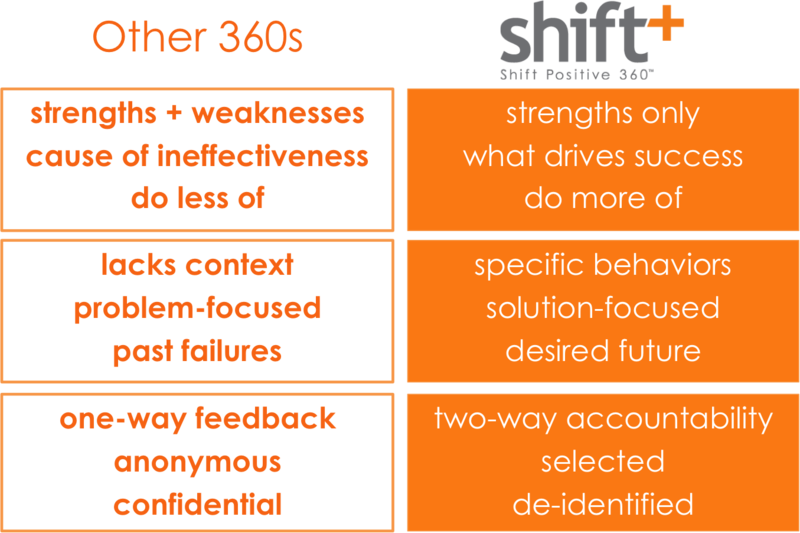 Shift+ 360 is a narrative 360 approach used by executive and leadership coaches. This approach is grounded in positive psychology and focuses on engaging the client's "people system" throughout the change process. Positive psychology is the study of human strengths and well-being which employs proven methods to promote the flourishing of people, organizations, and communities. The client's "people system" is the group of people who participate in the 360 and become allies in the client's change. systems thinking to garner allies from the client's "people system"
Overall, this process is not just about the individual client. It is about creating an environment that is conducive to the client's progress and engagement; creating fertile soil for successful growth. It is about creating deeper, lasting change, faster, and with more dialogue, disclosure, and depth of thought by all participants—all stakeholders in each other's success. how does shift+ 360 compare? The shift+ 360 takes a solution-focused approach which helps you as coach share context with your client so they can see in their own mind's eye what to do, to be more effective. The shift+ 360 is not confidential—intentionally. In order for the client's people system to support the client through her/his development, it's important that the client knows and chooses the participants. The feedback is de-identified to prevent the client from putting a different lens to the feedback when first receiving it. Ultimately, however, the client will have a sense of who said what—and that's a good thing—as it's the first step in engaging each person to support the client through change. "I have always known that there had to be a better way to conduct a 360 assessment as well as a better way to provide feedback. This is the better way." Shift+ 360 was co-founded by two Hudson Institute PCC level coaches, Pete Berridge and Jen Ostrich. Pete has a Masters in Applied Positive Psychology and created the shift+ 360 process five years ago to use in his own executive coaching practice. Jen brings 15 years of navigating people systems across the advertising industry to create positive results, and has used the shift+ 360 exclusively for the last three years in her leadership coaching business. Together they have a collection of positive outcomes and have developed this certification at the request of many coaches and human resource professionals. After 14 years of leading teams and clients in the advertising industry, Jen decided to follow one of her own core beliefs of "leap and the net will appear" when she sprung into a new career of leadership coaching. 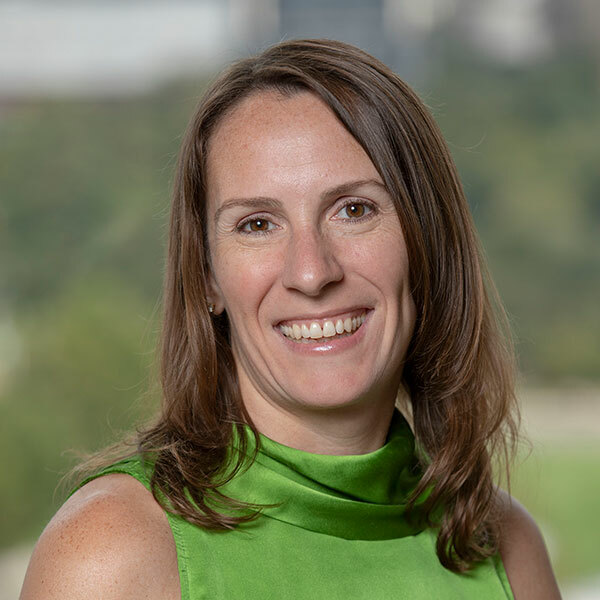 To complement her BA in Communications from Penn State, Jen is certified in leadership and transition coaching by the prestigious Hudson Institute, considered to be "the Harvard of Coaching." Since then she's become a PCC level coach with the ICF after completing nearly 1,000 hours of coaching. Jen is the founder of ostrich coaching + consulting where she works primarily with leaders in creative communities such as advertising, marketing and technology. Jen is passionate about helping leaders craft their own leadership brand and then living and leading a life that's authentic to who they truly are. Through positive psychology, emotional intelligence, the work of Brene Brown and other experience across business and marketing, Jen brings a unique combination of being able to think like a coach, a leader, a brand and a business person. As the co-founder of the shift positive 360, Jen is thrilled to be a change agent for how to give feedback in an energizing and effective way while helping others to create sustainable positive change. When she's not running her two businesses, Jen enjoys eating her way through Austin with her outrageously handsome dog, Koko. 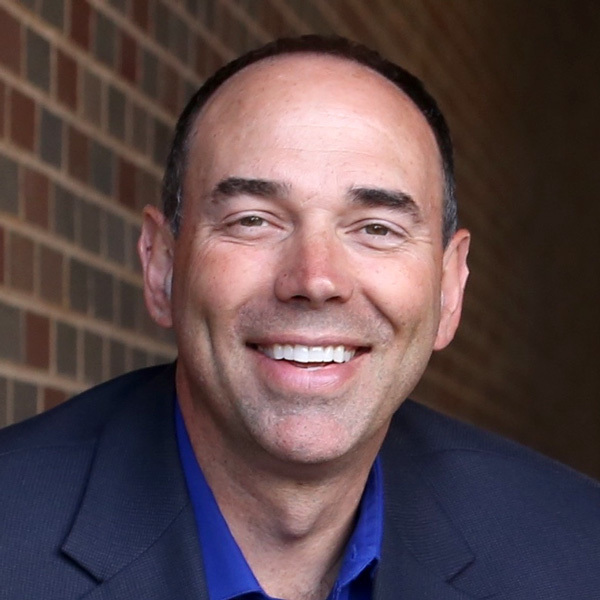 Peter Berridge is an accomplished coach and facilitator who utilizes the sciences of positive psychology and executive coaching to help individuals, teams, and organizations be more engaged, effective and productive. Pete became a certified executive coach through the Hudson Institute of Santa Barbara and is one of 300 people in the world with a Master of Applied Positive Psychology (MAPP) degree from the University of Pennsylvania. Positive psychology is the study of human strengths and well-being which employs proven methods to promote the flourishing of people, organizations, and communities. Pete also has advanced training in the art of appreciative inquiry and visual facilitation, which he uses to engage organizations and their stakeholders in a highly interactive way, to envision a compelling future, and to move forward with focus and energy. Pete is the founder and president of Shorebird Coaching and Consulting. He has 25+ years of coaching (more than 3,000 hours of individual coaching), facilitation, and Human Resources experience, culminating as executive VP of Human Resources at Courage Center, a nationally respected healthcare agency serving over 20,000 people with disabilities annually. Pete's passion is coaching senior executives, rising leaders, teams, and organizations that are navigating challenges and charting new directions.